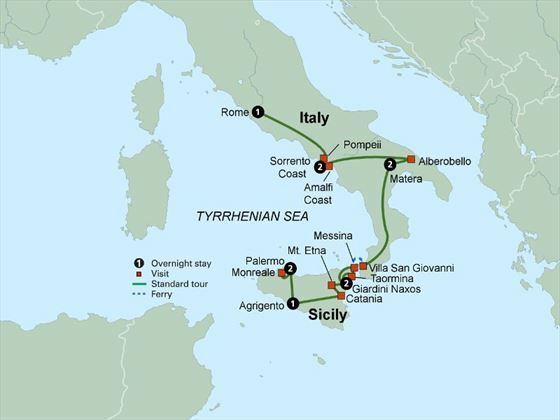 Discover the island of Sicily located in the centre of the Mediterranean Sea at the tip of the Italian peninsula, on a 12-day escorted tour also taking in the sights of Southern Italy. 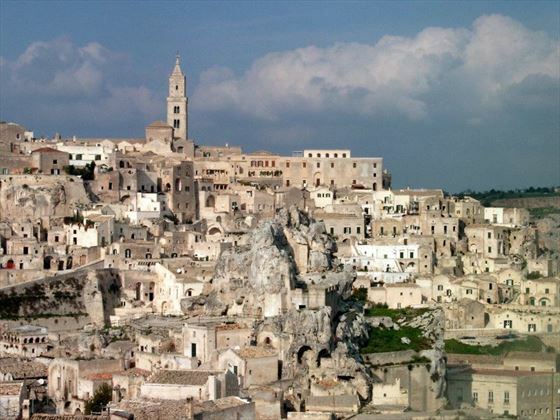 Highlights include the two unique towns of Matera with its cave dwellings and Alberobello with its domed roof dry-stone trulli houses, and the beautiful coastal regions of Sorrento and Amalfi. En route you will also see two volcanoes – Etna and Vesuvius, and visit the preserved remains of Pompeii dating back two thousand years. This evening begin your tour by joining your fellow travellers for a special welcome dinner featuring Sicilian cuisine. Palermo is a dynamic city with surprising highlights, mixing Arabian domes with Norman architecture, bustling markets with Baroque buildings. 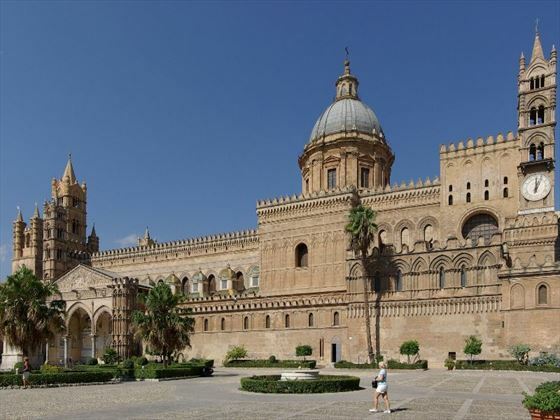 You will start with a cultural tour featuring the lovely squares of Quattro Canti, Piazza Pretoria and Piazza Bellini, and will be able to see the Palace of the Normans – considered to be one of the most magnificent Arab-Norman structures in the world, the ancient church of La Martorana and the awe-inspiring Cathedral of Palermo. In the nearby town of Monreale, visit the 12th century Cathedral where inside you will find breath-taking mosaics throughout its interior illustrating scenes from the bible. Enjoy the rest of the day at leisure to explore the sights, perhaps visit one of the fascinating museums or climb one of the towers for a panoramic view of this dazzling city. 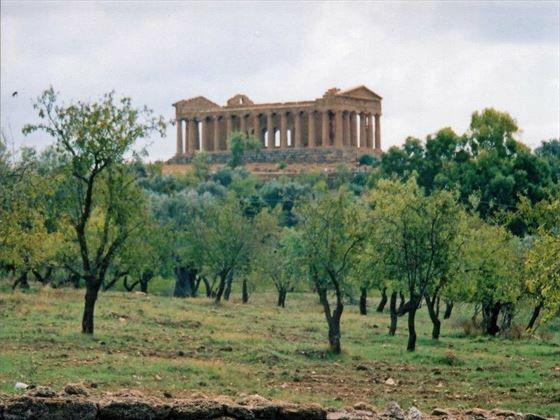 Travel southwards through the beautiful countryside with its rolling hills and farmland until you reach Agrigento. Here you will visit the UNESCO World Heritage Site of the Valley of the Temples. Experience a close-up view of the ancient temples of Juno, Concordia, Hercules and Jupiter, dating back to around 450 BC. 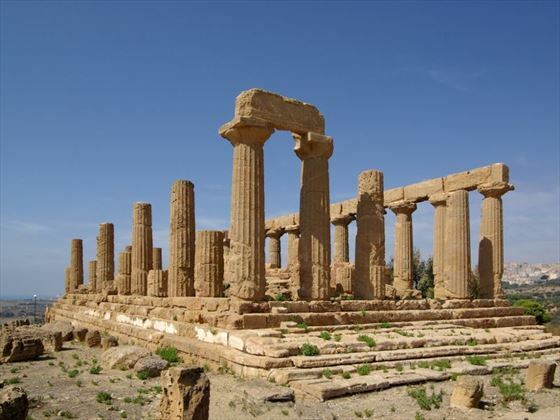 You will marvel at the sight of the Temple of Concordia, one of the best preserved Doric temples in the world. Today traverse the island, through spectacular landscapes and picturesque towns, until you reach the city of Catania on the east coast. Here a local guide will share its history and show you the cathedral which dates back to the 12th century but was largely rebuilt in the 17th century in Baroque style after a catastrophic earthquake. Visit the local market and experience the daily spectacle of bartering for fresh fish and produce. Next visit Mount Etna Volcano National Park and see the fascinating landscape cut through with lava flows formed through the centuries. Drive onto Giardini Naxos, a seaside resort located on a wide sweep of bay just beneath the historic town of Taormina, where you will stay for the next two nights. 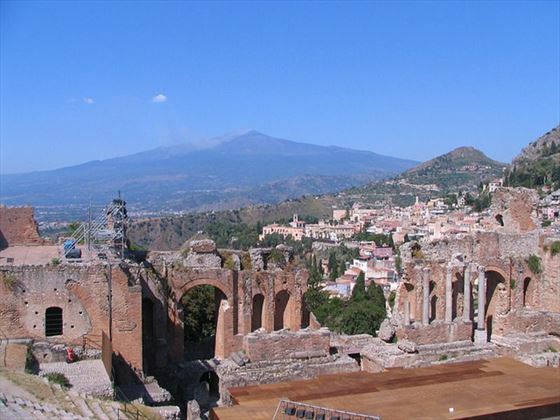 This morning you will visit charming Taormina, famous for its beautiful gardens and significant monuments. During a guided tour you will see the glamorous shops and vibrant restaurants of the Corso Umberto, and the pretty Public gardens with an abundance of exotic flowers. You will also visit the Greek Theatre dating back to the third century BC and used variously as an amphitheatre for gladiator sports, a theatre for dramatic productions and a palatial residence. You will have the rest of the day at leisure to stroll the medieval streets and enjoy a gelato. Today you will be taking a short ferry ride from Messina to the Italian mainland. Travel northbound through the beautiful and unspoilt region of Calabria and into the region of Basilicata. This afternoon you will visit a local winery for an informative walk through the cellars and vineyards followed by a wine tasting. You will then enjoy a delicious regional dinner in the winery’s own “agriturismo” restaurant. Today explore the uniquely historic Sassi di Matera, where cave dwellings have been inhabited from prehistoric times right up until the 1950’s. A local guide will take you on an awe-inspiring tour through the astonishing cave houses and churches. Pause at a local shop to sample some regional produce, and then enjoy some free time to explore one of the oldest inhabited sites in Italy. This evening you will enjoy a pasta-making demonstration followed by a fabulous dinner featuring many regional favourites. 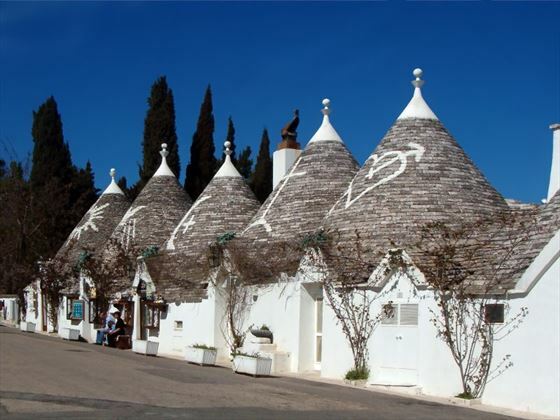 Travel northeast through Italy to the unique town of Alberobello filled with quirky little trulli houses – ancient dry-stone constructions with a conical roof. 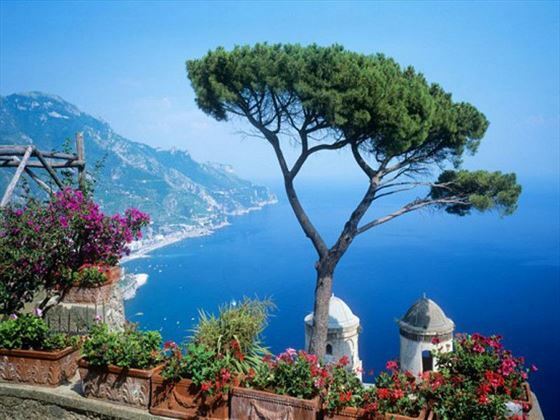 Then traverse to the west coast towards the Bay of Naples, a breath-taking stretch of coastline. Arrive on the Sorrento Peninsula where you will spend two nights – take in the beautiful panoramic views and enjoy an evening meal. Begin the day with a stroll around the popular pretty seaside resort of Sorrento. Visit a local shop and learn about the local craft of inlaid wood making. You have free time to explore this lovely relaxed town, admiring the views over the Bay of Naples whilst you sip the local liquor limoncello. Then take a scenic drive to Amalfi, a charming town which you will be able to explore the pretty streets and stroll along the seafront promenade. Then take a short drive up the coast to Minori where you will have the opportunity to sample some local specialities at a family-owned limoncello production house. You will also have an afternoon break to enjoy some pastries and treats at a local café, and then you have the evening at leisure. 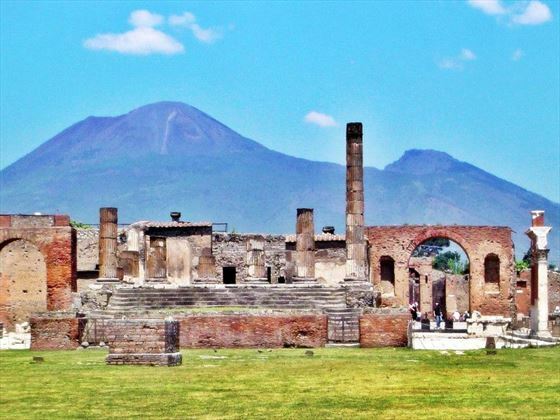 Today you will immerse yourself in history, visiting the excavated ruins of Pompeii in the foothills of Mount Vesuvius. 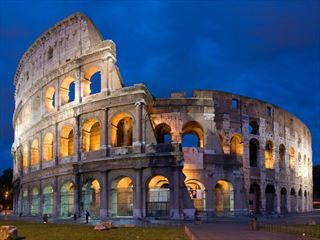 Soak up history, guided by a local expert, as you see the preserved buildings of a typical Roman town from 2,000 years ago – with villas, streets and even the casts of people and animals frozen in time after being buried in 20 feet of ash and pumice from the eruption of Vesuvius in 79 AD. Later travel to Rome where you will spend your final evening, with a farewell dinner to toast your Italian adventure with your fellow travellers. 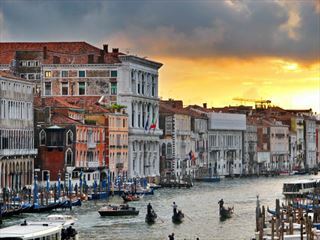 An unique escorted tour with 3 nights staying on a beautiful estate in Tuscany, then 3 nights on the Italian Riviera. Enjoy Tuscany’s rolling countryside whilst savouring the local food & wine. 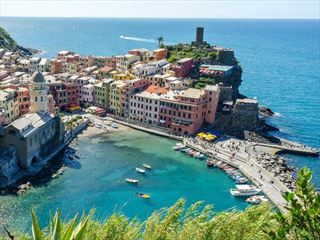 Relax on the beautiful Italian Riviera with scenic bays, ancient churches and villas.